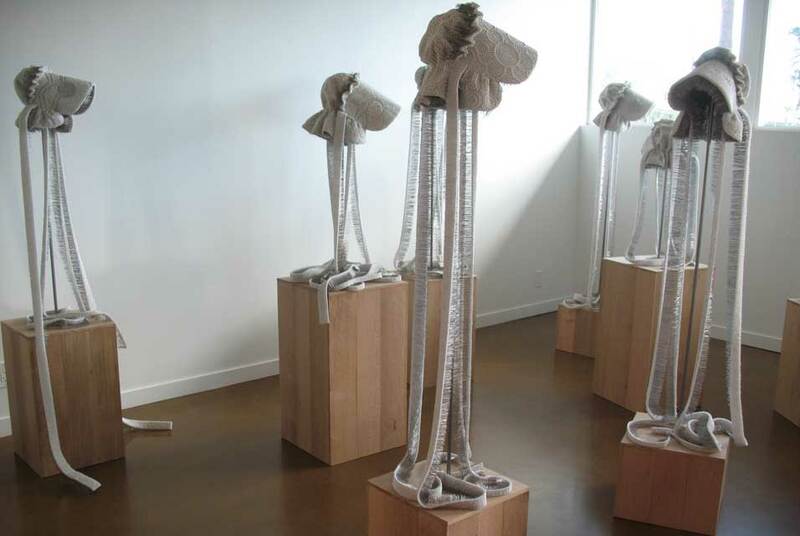 “Seer Bonnets: A Continuing Offense,” Installation view (Detail); Pearl-tipped corsage pins, fabric, steel, and white oak plank; 2009-2010; Artist: Angela Ellsworth; Photo Credit: Angela Ellsworth; Courtesy of the artist and Lisa Sette Gallery. TEMPE, AZ.- Taking the international stage at the 17th Biennale of Sydney this spring are the artistic perspectives of six ASU Herberger Institute scholars and artists. Bruce W. Ferguson, the director of F.A.R. (Future Arts Research) @ ASU; Claudio Dicochea, recent School of Art alumnus; three current graduate students; and angela Ellsworth, School of Art assistant professor, display their works within several sites and venues around Australias world-renowned city, May 12  Aug. 1. An occasion of this magnitude has pressed Ellsworth to consider her work on a larger physical scale, and think about how it is viewed by those who live outside the United States  especially the western states. Her unique re-examination of an homage to the walking treks made by female Mormon pioneers of 19th century America is present in both her installation and durational performance. Nine pioneer bonnets, each covered with nearly 20,000 white pearl-tipped corsage pins, comprise Seer Bonnets: A Continuing Offense. The work was inspired by Ellsworths research of her family lineage. A team of student assistants have worked daily in the studio to help Ellsworth with the Biennale installation piece. Current fibers graduate student Brooke Heuts has toiled intensively as Ellsworths research assistant for the Biennale project. Heuts and Jenea Sanchez, an intermedia graduate student, join dance graduate student Crystal Bedford, to be a part of Ellsworths performance, Meanwhile, back at the ranch. During the Sydney Biennales opening week, Ellsworth and the students work with Sydney-based performers to rehearse Meanwhile, back at the ranch. Wearing long braids and modest prairie attire, the women perform a search for each other over a two-hour timeframe. Once they unite, they begin the Electric Slide, a popular line dance that is performed at diverse cultural celebrations across the United States. The women disperse after the dance is complete and begin to search for each other again, and reunite later and repeat the dance. Ellsworth is delighted to have these students make the trip with her. The Biennale bonds reach past Ellsworth and her students. Claudio Dicochea, recent School of Art alumnus, shows four paintings from his contemporary collection of works, which are inspired by casta paintings of colonial Mexico that demonstrated growing racial integration in the New World. He believes that his approach to his work completely has been enhanced by his graduate studies in the Herberger Institute. During his graduate studies, Dicochea was amazed by the chance to meet with David Elliott, the artistic director of the 17th Biennale of Sydney. During a lecture visit to the Valley, Elliott was urged by Bruce W. Ferguson, director of F.A.R. (Future Arts Research) @ ASU, to dig deeper in to the Phoenix arts scene. Ferguson previously met Elliott at a conference, and their steadily developing professional relationship proves to be an essential element to advancing F.A.R.s mission. The Elliott-Ferguson connection ultimately led to Ferguson writing an essay for the Sydney Biennale catalog. Fergusons piece discusses how great works of art are inspired by deserts, how artists often are ahead of other thinkers, and when it comes to serious world issues that art is at the forefront of other disciplines. Ferguson feels strongly that discipline, combined with access to professionals like Elliott, is evidence to local artists that showing work at the Sydney Biennale is not unattainable. See the works of Ellsworth and Dicochea at the Lisa Sette Gallery in Scottsdale, Ariz.
Sotheby's to Sell the Collection of the Late Francis Egerton and Peter Maitland, Pioneers of the "Mallett Style"